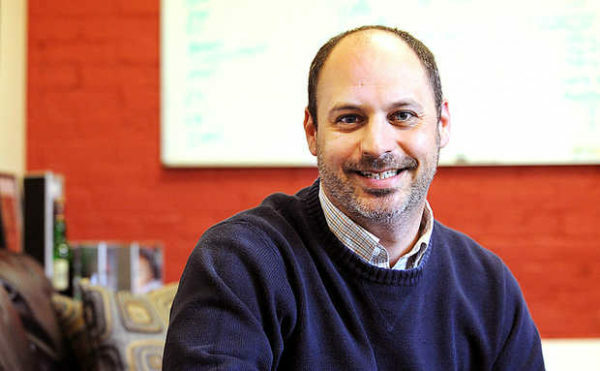 Argo Marketing Group CEO Jason Levesque seen in his Lewiston office. AUBURN, Maine — Businessman and former Republican congressional candidate Jason Levesque won the Auburn mayoral race by six votes Tuesday behind a campaign aimed squarely at beating back the failed merger with Lewiston on the ballot alongside him. Levesque, 43, the CEO of Argo Marketing Group, won a two-year term over City Councilor Adam Lee. If the tallies hold, he will keep the nonpartisan seat in Republican hands after Mayor Jonathan LaBonte, who runs Gov. Paul LePage’s policy office, declined to run for a fourth term. On Tuesday night, Levesque called Lee “a very spirited challenger” and that he would seek Lee’s counsel in office. Lee, a Democrat, said he would “take a day” before deciding whether to request a recount in the race. Levesque is an Auburn native with no political experience other than an unsuccessful 2010 run against former U.S. Rep. Mike Michaud in Maine’s 2nd Congressional District. His run was built on opposition to the proposed Lewiston-Auburn merger, which failed Tuesday. Lee backed the merger. Levesque said at an October mayoral debate that he wanted to defeat the merger and “make sure it never happens again,” adding that he wouldn’t take the mayor’s seat if the merger also passed. He also promised to play an active role in local economic development.